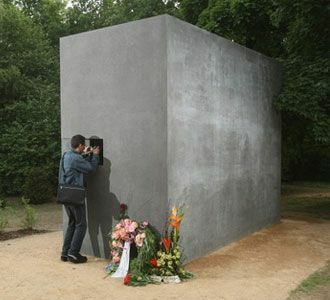 On 27 May 2008, German politicians dedicated a memorial in Berlin to the tens of thousands of homosexuals persecuted during the Nazi regime. Seventy-five years ago Nazis launched a series of raids and public book burnings aimed at homosexuals. It was the start of Adolf Hitler’s crusade against homosexuality which saw an unknown number of gays arrested, tortured and murdered by the Nazis. Nazi persecution of homosexuals had long been swept under the carpet. Between 5,000 and 10,000 homosexuals were deported to concentration camps. During its crackdown on homosexuals the Nazi regime began 100,000 legal proceedings, followed by 45,000 sentences under a criminal law that endured until 1969. The new memorial will bring the past persecution and ongoing struggles of homosexuals to the heart of the German capital. Germany’s lower house of parliament in 2000 formally apologized to gays persecuted under the Nazi regime. In 2002 the German parliament issued a formal pardon for gays convicted under the Nazis. On 12 December 2003 the Parliament funded the homosexual memorial. The memorial consists of a grey rectangular block some four meters tall. One side has a small opening through which viewers will see a black and white art film scene of two men kissing. The kissing scene will be changed every two years. “A simple kiss could land you in trouble,” says the text which accompanies the memorial. After the war, surviving Jews and others were released from the concentration camps, but homosexuals were not. The laws used to prosecute homosexuals continued long after the Nazis had been defeated; 44,231 sentences were imposed on gays in the occupied zones of the West and in West Germany. Legal discrimination against homosexual men ended in 1994, four years after German unification. East Germany had abolished its anti-gay legislation in 1968. Designed by Scandanavian couple Ingar Dragset and Michael Elmgreen, who live in Berlin, the memorial will be opposite the Holocaust memorial on the margins of the Tiergarten, Brandenburg Gate and the Reichstag. The concrete sculpture complements Peter Eisenman’s design of the Holocaust monument, using its gray cement slab theme. At first it was debated whether homosexuals should be included in the larger memorial before the decision was made to give homosexuals their own monument. But the design corresponds to the Holocaust Memorial’s field of steles, a series of concrete blocks of varying sizes. Dragset and Elmgreen’s work is interesting and some is subversively queer. Elmgreen and Dragset explore how spatial conditions, everyday design, architecture and urban planning shape cultural identities and influence our social behavioural patterns. They challenge the conventional perception of architecture and its mechanisms of control and its complicity in defining our enactment of psychological states. The work challenges conventional perceptions of space. Elmgreen and Dragset reorganise architectural and social structures to investigate the underlying desires and mechanisms of control in even the simplest arrangements of walls, ceilings, entrances and exits. Below are a few links in English. Queering the cube: architecture and identity in the work of Michael Elmgreen & Ingar Dragset, by Alison Gingeras. 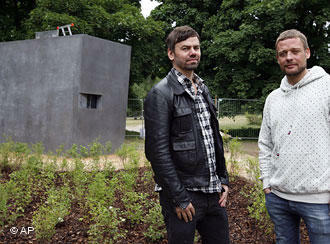 Interview with Elmgreen and Dragset, by Brian Shollis. 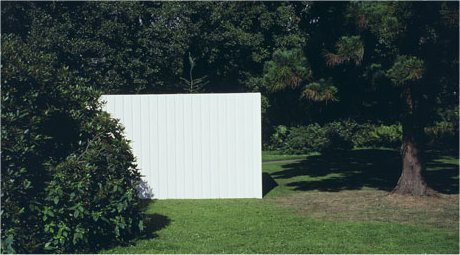 White on White: The Art of Michael Elmgreen & Ingar Dragset, ArtForum, April, 2002, by Daniel Birnbaum. Article by Arken Museum, Denmark.